Editor's Introductory Note: Our planet has been slowly warming since last emerging from the "Little Ice Age" of the 17th century, often associated with the Maunder Minimum. Before that came the "Medieval Warm Period", in which temperatures were about the same as they are today. Both of these climate phenomena are known to have occurred in the Northern Hemisphere, but several hundred years prior to the present, the majority of the Southern Hemisphere was primarily populated by indigenous peoples, where science and scientific observation was limited to non-existent. Thus we can not say that these periods were necessarily "global". However, "Global Warming" in recent historical times has been an undisputable fact, and no one can reasonably deny that. But we're hearing far too often that the "science" is "settled", and that it is mankind's contribution to the natural CO2 in the atmosphere has been the principal cause of an increasing "Greenhouse Effect", which is the root "cause" of global warming. We're also hearing that "all the world's scientists now agree on this settled science", and it is now time to quickly and most radically alter our culture, and prevent a looming global catastrophe. And last, but not least, we're seeing a sort of mass hysteria sweeping our culture which is really quite disturbing. Historians ponder how the entire nation of Germany could possibly have goose-stepped into place in such a short time, and we have similar unrest. Have we become a nation of overnight loonies? Sorry folks, but we're not exactly buying into the Global Hysteria just yet. We know a great deal about atmospheric physics, (bio) and from the onset, many of the claims were just plain fishy. The extreme haste with which seemingly the entire world immediately accepted the idea of Anthropogenic ( man-made ) Global Warming made us more than a little bit suspicious that no one had really taken a close look at the science. We also knew that the catch-all activity today known as "Climate Science" was in its infancy, and that atmospheric modeling did not and still does not exist which can predict changes in the weather or climate more than about a day or two in advance. So the endless stream of dire predictions of what was going to happen years or decades from now if we did not drastically reduce our CO2 production by virtually shutting down the economies of the world appeared to be more the product of radical political and environmental activism rather than science. Thus, we embarked on a personal quest for more information, armed with a strong academic background in postgraduate physics and a good understanding of the advanced mathematics necessary in such a pursuit. This fundamental knowledge of the core principles of matter and its many exceptionally complex interactions allowed us to research and understand the foundations of many other sciences. In short, we read complex scientific articles in many other scientific disciplines with relative ease and good understanding - like most folks read comic books. As our own knowledge of "climate science" grew, so grew our doubts over the "settled science". What we found was the science was far from "settled".. in fact it was barely underway. It was for a while a somewhat lonely quest, what with "all the world's scientists" apparently having no doubt. Finally, in December 2007 we submitted an article to one of our local newspapers, the Addison Independent, thinking they would be delighted in having at minimum an alternative view of the issue. Alas, they chose not to publish it, but two weeks after our submission (by the strangest coincidence), published yet another "pro-global-warming" feature written by an individual whom, to the best we could determine, had no advanced training in any science at all, beyond self-taught it would appear. Still, the individual had published a number of popular books on popular environmental issues, was well-loved by those of similar political bent, and was held in high esteem among his peers. We had learned a valuable lesson: Popular Journalists trump coupled sets of 2nd-order partial differential equations every time. Serious science doesn't matter if you have the press in your pocket. In fairness to the Addison Independent and its editors, our article was somewhat lengthy and technical, and presumably the average reader most likely could not follow or even be interested in an alternative viewpoint, since everyone knew by now that the global warming issue was "settled science". And we confess that we like the paper, subscribe to it, and know a number of folks who work there personally. They're all good folks, and they have every right to choose what does or doesn't go in their publication. They also have a right to spin the news any direction they choose, because that's what freedom of the press is all about. Seems everyone, both left and right, does it - and it's almost certain we will be accused of doing the same here. And we just may be, as hard as we may try to avoid it. We humans aren't all shaped by the same cookie cutter, and that's a blessing that has taken us as a species to the top of the food chain. But by then we had been sharing our own independent research of the literature with others via email, and receiving a surprising amount of agreement back in return. (We're in contact with a large number of fellow scientists around the country, dating back to our college days in the 17th century when beer was a quarter a bottle). One local friend, in particular, kept pressing us to publish, and even offered to set up a "debate" with the Popular Journalist who had usurped our original article. This we politely declined, arguing that "debate" cannot prove or disprove science...science must stand on its own. We decided to publish the results of our counter-exploration on the internet - but in a somewhat uniquely different fashion. Knowing that most folks aren't geeks, and may have little understanding of science or math, we're going to attempt to teach some of the essential physics and such as we go along. Readers with little or no mathematical or scientific training may find it challenging, but if you have a general understanding of introductory college or even solid high school level chemistry or physics, you should have no problem in following this amazing tale. The brighter readers, even without a science background, should be able to follow, as well. Smart folks learn faster than most. What follows is a tale gleaned from many sources over what turned out to be an unreasonably long period of time. We'll be first examining a "worst case" scenario, using very simple math at first, in order to arrive in a ballpark that will tell us if we need to go further and pull out long strings of complicated equations, which we don't want to have to resort to because we're writing for the average layman who is not a rocket scientist. This is a valid scientific method despite its apparent simplicity, for if one can first determine that a person does not own a motorcycle, then you don't have to spend a lot of time calculating how likely he is to crash while riding it. Reducing it to the simplest of terms for the average person to understand was a daunting task. Below is an example of what "real" Climate Scientists have to deal with on a daily basis. Is it any wonder that the most popular majors in college are liberal arts? Solar-Cycle Warming at the Earth’s Surface and an Observational Determination of Climate Sensitivity. Don't fret - neither Al Gore nor any of the Popular Journalists can understand it either. We're reminded of an earlier story, which happened back in 1912. This was the amazing discovery of a skull and jawbone in which was quickly named the Piltdown Man and which all the world's archaeologists immediately accepted as a hitherto unknown form of early human. It appears no one bothered to examine it closely, assuming that other scientists had thoroughly investigated and vetted it. The hoax wasn't uncovered until 1953, when it was learned that the skull was that of a modern man and the jaw that of an orangutan. Seems no one had ever bothered to take a really close look at the artifact. Well, folks, it does appear we have a new, 21st Century Piltdown Man, and this time we know his name. He's called "Anthropogenic Global Warming"
It's hard to nail down exactly when the sky started falling, but certainly the work of Michael Mann provided its first global exposure. Michael Mann, a paleoclimatologist ( one who attempts to interpret the past climate through certain Paleolithic records, such as ice core samples, sea bed sediments, coral heads, and tree ring growth ), submitted a paper to Nature magazine in 1998 which, unfortunately, was not subjected to peer review before publication. In it, he offered what has now become known as the famous "hockey stick" chart, showing the earth's temperature having been relatively constant for the past thousand years before suddenly skyrocketing upward at the dawn of the 20th century. His interpretation was that man's production of CO2 in the modern age was obviously responsible for the sudden increase. It turned out to be one of the biggest scientific blunders of all time. Look carefully at the chart above, which is the famous "hockey stick" chart. Note the horizontal scale is in years, stretching from the year 1000 to the near present time. The vertical scale is in degrees Centigrade, and note carefully that it is graded in increments of 1/10 of a degree. That means the wiggly blue section in the middle is actually only varying up and down by about a half of a degree. The baseline, as noted, is set at the average of the recorded temperatures from 1961 to 1990. Also note that only the red portion represents actual measured temperatures - the rest is based on the assumption that one can interpret past temperatures from examining ancient tree rings or ice core samples from centuries-old ice locked in glaciers. This is, at best, a marriage of apples and oranges - the handle being somewhat of an educated guess, and the blade being based on actual measurements using thermometric recording devices. Sort of like pairing the skull of a human with the jawbone of an orangutan. And finally, note that the chart is for the northern hemisphere only. This chart, unfortunately, became the foundation for the first report of the United Nations International Panel on Climate Change ( IPCC ), which in turn provided the summary information and recommendations to the world's governments. The Anthropogenic Global Warming panic was off to a rocketing start. However, some folks noticed a couple of significant and fairly well accepted climatological history facts to be conspicuously missing. The first was the well-documented "Medieval Warm Period" where temperatures, at least in Europe as mentioned in our introduction, were significantly higher. The second was the "Little Ice Age", a period in which the temperatures dropped so low the Thames River in London froze over. How could this be an accurate record of the last millennium? Let's pause and mention that the data above is not "raw" data. Dr. Mann actually used about 70-80 data sets, and in each set he applied a mathematical analysis known as a principle component analysis ( PCA ) which seeks to extract principal, or significant component information from a widely varying set of raw data. Along comes Steve McIntyre, a Canadian analyst, who spends two years of his own personal time reverse-engineering Dr. Mann's PCA program. McIntyre subjects Mann's PCA program to a "Monte Carlo" analysis - which inserts random data sets into the function - and discovered that no matter what data he fed it, the result was always the same. 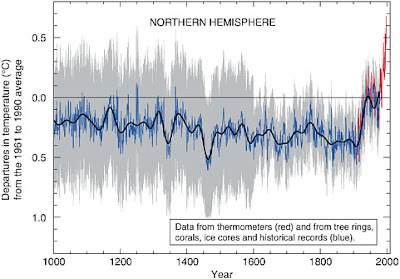 The arm of the "hockey stick" ( paleo-record ) always came out straight. In Dr. Mann's case, the rising temperature of the Medieval Warm Period and the expected trough of the Little Ice Age had been completely erased. The hockey stick was broken. Fini. Kaput. We may never know whether Mann's work was deliberately contrived to fit some personal environmental agenda, or just a colossal mathematical blunder. McIntyre submitted his work to Nature Magazine - since they were responsible for publishing Mann's flawed research without peer review in the first place, but they reportedly rejected it, saying it was "too long". He then shortened it to 500 words, and re-submitted it, but again it was rejected, this time saying it was "too mathematical" or words to that effect. Heaven forbid any publication calling itself an "International Weekly Journal of Science" from actually publishing any science that hinged on mathematics. Let's all push a yard stick into the snow, measure the snow depth, call ourselves "climate scientists", and get published in Nature. In the end, McIntyre turned to the internet and its true freedom of the press, and today he is known to every serious climate scientist on the planet as the man who broke the hockey stick. The National Academy of Sciences has found Mann's graph to have “a validation skill not significantly different from zero” – i.e., the graph was useless. Note the corrected version, below, in which neither today's temperatures nor the rate of warming are particularly unusual compared to the historical record. Thus, even the "global warming" of the 20th century was not even remotely a cause for the slightest alarm. It was all "much to do about nothing". Since our emergence from the Little Ice Age, agriculture has again flourished, and most of us hope it lasts quite a while longer. This is certainly no cause for panic, and a few of us think being comfortably warm and having plenty to eat is actually good. And Tom Nelson has a few more graphs the AGW folks don't want you to see posted HERE. Into the Laboratory, it's time to go to work. What we commonly call "light" is actually electromagnetic radiation, physically no different from radio waves, except of different frequencies and wavelengths. The part we can see is called the visible spectrum. Beyond what we can see in the higher frequencies ( and shorter wavelengths, since they are reciprocal functions ) lies the ultraviolet spectrum. UV light is very penetrating, which is why one could get sunburned on an overcast day. Beyond even that are X-rays, which can penetrate much deeper. On the opposite end of the visible spectrum lies infra-red... which you can't see, but you can easily feel, as anyone who has warmed his hands near a hot stove can testify. It is the infrared portion we commonly refer to as "heat" radiation. And beyond that are the radio and television wavelengths we all know and love. The sun is very "bright", and its frequency spectrum is generally too short to produce much infrared coming down through the atmosphere. Radiation from the sun penetrates the atmosphere, strikes the earth, and some of it is absorbed and some is reflected. The different bandwidths (colors) of reflected light depend on the material struck, so something green-colored is reflecting the green portion of the visible spectrum and absorbing the rest. This heats up the earth, and that's the first part of the story. All heated bodies emit radiation in the infrared range. This is called "black body" radiation, because a perfectly black body reflects no visible light but still emits radiation in a specified band of wavelengths. Infrared radiation is of a much longer wavelength, and can be much easier absorbed by certain components in the atmosphere, causing them to also "heat up". The warm air around us is being kept warm partially from black body radiation coming from the earth itself. Another method of warming is by conduction - air coming in contact with the heated soil, rocks, trees, buildings, etc. and being directly warmed by that contact. This may be a bigger factor than we think, but we're not going to attempt to try to determine just how much that might be. We'd have to know the total surface area of every object - down to the smallest blade of grass - there is on our planet. We also need to remind ourselves that there is actually no physical quantity known as "cold". There is only "heat" and "lack of heat". Note: In our original draft, we talked a bit about relative spacing geometry, to give the reader a feel for the distance between molecules in the atmosphere. We talked in (very crude) terms about tacking bottle caps up on a barn wall, and gave some spacing examples in 2 dimensions for a rough feel of the subject. One of our readers, Peter J. Morgan - a consulting engineer from New Zealand - undertook to re-write our simple ( and not technically accurate ) description for his 15 year old son. He was kind enough to send it to us, and we liked it so much we threw out our South Park estimate and substituted his work instead. Thanks, Peter! To give you a feeling for how little CO2 there actually is in the atmosphere, let's note that atoms and molecules are very tiny things, and the distances between them are therefore also very small. Physicists like to use a unit of measure called an Angstrom, which is 0.1 of a nano-meter, or a 0.1 billionth of a meter, (i.e. 10-10 of a meter or 10-7 of a mm). A molecule like CO2 has a size of around two Angstroms (2 x 10-7 mm). The density of the gas is 10 to the 24th power number of molecules occupying a space of about 22 liters (i.e. 4.55 x 1022 molecules per liter) at a pressure of 760mm of mercury and 273 degrees Kelvin (i.e. 32 degrees Fahrenheit or zero degrees Celsius) – called the "standard temperature and pressure". You can almost think of all this as just the normal temperature and pressure around you right now. A simple calculation shows that in a 3-dimensional tetrahedron array, as shown in the diagram below (for the closest possible packing with an equal distance between molecules), the spacing between molecules is approximately 28 Angstroms. Since at 2 x 10-7 mm diameter, CO2 is a very tiny molecule, let's magnify the picture by a factor of 10 million, so that we can imagine a CO2 molecule as a 20 mm diameter marble floating in the air. However, CO2 makes up only 380 of each million molecules of air – the rest are a mixture of all the other atmospheric gases and water vapor – i.e. only one in every 2632 molecules is a CO2 molecule. Let’s imagine that all the other molecules are colored blue, and CO2 molecules are colored red. All the marbles making up our model atmosphere are equispaced at 280 mm apart. When mixed evenly into our model atmosphere (which is what the wind does) a bit more simple math shows that our red marbles are equispaced at 3900 mm (i.e. 3.9 meters) apart. In the real atmosphere, at a height of approx. 5500 meters, pressure is halved from what it is at sea level. A bit more simple math shows that at a height of 5500 meters (55 million kilometers in our model – that’s 143 times the distance from earth to the moon! ), our 20 mm diameter CO2 marbles are equispaced at 4.9 meters apart. Now you know why CO2 is called a “trace” gas. We've decided to be exceptionally generous to all concerned in the debate and look at the worst-case scenario, where we'll say that all of the available heat in the CO2 absorption spectrum is actually captured. We know that man is responsible for about 3 % of it, so with the simplest of math, we have .03 x .08 = .0024. And remember that 8% figure was actually larger than reality, since the two side peaks don't have much energy to capture. And, if all of the available heat in that spectrum is indeed being captured by the current CO2 levels before leaving the atmosphere, then adding more CO2 to the atmosphere won't matter a bit. "Al Gore likes to say that mankind puts 70 million tons of carbon dioxide into the atmosphere every day. What he probably doesn't know is that mother nature puts 24,000 times that amount of our main greenhouse gas -- water vapor -- into the atmosphere every day, and removes about the same amount every day. While this does not 'prove' that global warming is not manmade, it shows that weather systems have by far the greatest control over the Earth's greenhouse effect, which is dominated by water vapor and clouds." We can safely ballpark water vapor as being responsible for more than 95% of all the greenhouse effect, with oxygen and nitrogen playing no role and carbon dioxide being relatively insignificant... particularly the even smaller human-produced part. Side note: Both Oxygen and Nitrogen don't like to live alone. They prefer to find another and stick together into a diatomic ( 2 atom ) molecule. Thus the molecular weight of atmospheric oxygen or nitrogen is approximately twice that of one of them alone. We say "approximately", because it takes energy to bind them together, and mass and energy are equivalent stuff, as our good friend Dr. Einstein explained with his famous equation E=MC2. Now, you can sit back and give yourself a pat on the back, because you now know more pure physics of the atmosphere than a lot of so-called "climate scientists", and likely know more than almost all of the non-scientist Popular Journalists and other writers churning out panic-stricken books and newspaper articles on the subject. One would think this would be the end of the discussion, that the laws of physics show us that CO2 isn't even a significant "greenhouse gas" and certainly the human contribution is insignificant. We both now know that CO2 can't possibly be the evil byproduct all the ballyhoo has been claiming, and in fact, our biologist friends tell us if we could increase the CO2 content a little more, the planet would be much the richer... because plants love it, grow much larger with more of it, and we all like to eat. CO2 is a non-toxic, non-polluting, earth-friendly component that really is critical to our survival. Maybe that's why we laughed so hard when the Popular Journalist in the Addison Independent insisted that 340, rather than 380 parts per million CO2 was a "target" we should all shoot for. While you're pulling rabbits out of a hat, could you please bring me a Pepsi? OK, if you still are compelled to worry about something, think about this: The amount of oxygen in our atmosphere is slowly diminishing. A very long time ago, it was as much as 35% of the atmosphere, and has been shrinking ever since. We always wondered why those plant-eating eating dinosaurs had such long necks, and now we know - they had to reach up for dinner into the really tall trees that once dotted our oxygen-rich planet. But let's not worry about that just now, for this current story is far from over. If you've read this far, you're likely more curious than most, and probably more intelligent than average. And you probably want to know exactly what is causing the warming and cooling periods on the planet which have been going on for millennia. Inquiring minds want to know this stuff. Let's break for a minute, and point out that "Climate Science" is a catch-all term, like "Sports". The fellow who takes a daily temperature reading or measures the snow depth with a stick could call himself a "Climate Scientist" as much as the person tending the boiler in the basement could call himself a "Stationary Engineer". Earth's climate is an enormously complex subject, spanning not only the "pure" sciences like physics and chemistry, but many of the "natural sciences", such as oceanography, meteorology, volcanology, paleontology, archeology, solar science, and many others. All scientists aren't of the same quality, intellect, or natural talent for the trade. Sloppy scientists are as common as bad mechanics. At the top of the pecking order of knowledge needs sit the fundamental laws of physics - for no matter what others may determine, the final results must obey the fundamental, established principles which determine the nature of all elemental matter. Unfortunately, many "environmental scientists" actually study very little physics, chemistry or biology in depth. And many of the "lower" sciences involve little mathematics beyond introductory calculus. Before the greater body of scientists out there start beating on us, we'll admit that very few physicists had a time slot to study organic chemistry and beyond in college - and the truth of the matter is, there aren't enough semester hours available for everyone to be cross-trained in other disciplines to any competent depth. This makes becoming a highly skilled "Climate Scientist" very challenging, for this extremely complex field requires a very large tool kit. Thus, we trust others to deliver meaningful results from their specific disciplines. If a geologist tells us a particular rock is from the Devonian Period, we have little choice but to believe him. So in what follows, we're going to have to trust we have chosen good, solid scientists from other disciplines as our guide. In reading "scientific articles" one must also be very alert to use of the word "if". This is the killer word - the Colt .45 of sloppy or even deliberately misleading science. "If" the sea level rises 40 feet, then certainly most of Manhattan will be flooded. "If" the moon falls on Kansas, then certainly wheat prices are going to soar out of site. Within a sentence or two, "if" morphs into "when" and soon everyone is convinced that the moon is absolutely going to fall on Kansas, it's just a matter of time, we're all doomed... unless we take immediate action to stop it. But neither of these are very likely to happen, as we shall soon see. After the hockey stick was accepted virtually overnight without close examination ( like the Piltdown Man ), along comes Al Gore, a long-time "environmentalist", ( who made near-failing grades in science and math in college ) who decides to make a movie out of it. The hockey stick goes up on the big screen, and Gore boards a mechanical lift with cameras grinding, pointer in hand as he rises in unison with the blade of the stick which starts growing upward toward the ceiling. No longer are we talking about tenths of a degree, the temperature is rising like a puff pastry, and headed toward the attic. It all began with the word "if". If the hockey stick tip continues to rise (lift starts going upward, the audience holds its breath ) then... and along comes computer animations of New York flooding, Florida underwater, and poor little Polar Bears struggling to board the last piece of ice floating in the open Arctic Sea. (sigh...) It ends with Hurricane Katrina and Boston almost losing the pennant. It is Hollywood at its finest, and the Deacons of La La Land give it an Oscar. Even the Nobel Committee is impressed, gives it two thumbs-up and a Nobel Prize to Gore and the other members of the IPCC for the many lives that will be saved in the future because of this brilliant early warning. And, there's still time for we miserable humans to "save" the planet by buying "carbon offsets" accomplished best by investing in Al Gore's British company which buys stock in other companies that will benefit from a world-wide global warming hysteria (keeping a healthy cut) and making, perhaps, Al Gore the richest former Vice President in history. That will buy a lot of SUV's, jets, and large mansions with mega-electric bills. Everyone wins except the taxpayer and businessman, who are soon to pay a very heavy price. So what's really causing the endless cycles of warming and cooling, if it isn't a constantly changing "Greenhouse Effect" - with man to blame? Man wasn't producing much CO2 in the past million years, so he hasn't simply been turning the greenhouse up and down at will. Just look up - one of the most likely culprits is our old friend, the Sun. Patterson says he learned of the 1,500-year climate cycle while studying cycles in fish numbers on Canada's West Coast. Since the Canadian West had no long-term written fishery records, Patterson's research team drilled sediment cores in the deep local fjords to get 5,000-year climate profiles from the mud. The mud showed the past climate conditions: Warm summers left layers thick with one-celled fossils and fish scales. Cold, wet periods showed dark sediments, mostly dirt washed from the surrounding land. Patterson's fishing profiles clearly revealed the sun's 87 and 210-year solar cycles—and the longer, 1500-year Dansgaard-Oeschger cycles found since the 1980s in ice cores, tree rings, and fossil pollen. "Even though the sun is brighter now than at any time in the past 8,000 years, the increase in direct solar input is not calculated to be sufficient to cause the past century's modest warming on its own. There had to be an amplifier of some sort for the sun to be a primary driver of climate changes. Indeed, that is precisely what has been discovered," says Patterson. "In a series of groundbreaking scientific papers starting in 2000, Vizer, Shaviv, Carslaw and most recently Svensmark et al., have collectively demonstrated that as the output of the sun varies ... varying amounts of galactic cosmic rays from deep space are able to enter our solar system... These cosmic rays enhance cloud formation, which, overall, has a cooling effect on the planet." "When the sun is less bright, more cosmic rays are able to get through to Earth's atmosphere, more clouds form and the planet cools... This is precisely what happened from the middle of the 17th century into the early 18th century, when the solar energy input to our atmosphere ... was at a minimum and the planet was stuck in the Little Ice Age." The Canadian expert concludes, "CO2 variations show little correlation with our planet's climate on long, medium and even short time scales. Instead, Earth's sea surface temperatures show a massive 95 percent lagged correlation with the sunspot index." We'll talk about what a "correlation" means in a couple of minutes. So what does this all mean? 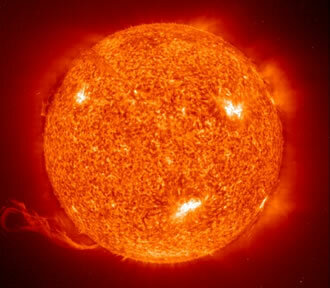 It means, in the simplest of terms, that it is the Sun which is warming the oceans, not an increased "Greenhouse Effect" caused by human activity. And, it might appear that Mother Earth is not the only one suffering from the Sun's effect. Data from NASA’s Mars Global Surveyor and Odyssey mission in 2005 disclosed that the carbon dioxide "ice caps” near Mars’ south pole had been shrinking for three consecutive summers. Mmmm... We could go on for endless pages on solar science and the sun's relationship to global warming, but we're not going to do that. One of the best summary articles we've found in simple layman terms is by Kevin Roeten, and you can read more on that by clicking HERE. If the Solar Scientists are correct, we about to head into a cooling cycle... which is not good news. Let's get back to our own science project. Wrong In fact, the blue line is exactly one pixel on your screen ahead of the red line. We know that because we made the chart. You couldn't tell that one was exactly like the other and actually leading it by one pixel without dragging out a powerful magnifying device and doing some very careful measurements and some pretty lengthy mathematics. So where did the increasing CO2 come from? You can't make CO2 out of Oxygen and Nitrogen... surely you're pulling my leg! Let's do a little simple Chemistry, and figure out the molecular mass of the different atmospheric constituents. For this we go to the Periodic Table of the Elements, and find the atomic mass of Nitrogen, Carbon, Hydrogen, and Oxygen. Let's forget about Argon, which is about 0.9% of the atmosphere, because it's supposed to be CO2 that's the evil stuff. To the nearest round number, Carbon = 12, Nitrogen = 14, Oxygen = 16, and lowly Hydrogen = 1. That's based on the number of protons and neutrons in the nucleus of the atom. The Periodic Table will give a slightly different number, because of that binding energy ( which is a mass equivalent ) we talked about earlier. Remember, we're rounding off to the nearest whole number, and amu means Atomic Mass Units. Do you see something significant? Think like a scientist. Yes, CO2 is by far the heaviest of the major constituents, and the law of gravity applies to it as well. It sinks to the ground.. in fact, into the ground, and into the oceans, as well, because CO2 is very water-soluble and that's what puts the fizz in Ginger Ale. This doesn't happen overnight. In fact, the winds and convection currents and such keep the air stirred up constantly, so it may take 100-150 years for the CO2 you are exhaling right now to make it back into mother earth, where most of it is currently locked up. Our satellites are pretty good at measuring overall ocean temperatures from afar, and CO2 measurements are being taken daily around the globe. The best results we have been able to turn up so far is that measurable CO2 increases appear about 9 months after an upswing in ocean temperatures. The data is messed up a bit every time a volcano decides to blow its top, because that's the mother of CO2 producers, bar none. And a buffalo emits about the same amount of methane (CH4) as driving your automobile about 8,000 miles - which can combine with O2 in a highly exothermic reaction ( gives off heat ) to produce CO2 and H2O as end products. One question that has been nagging us here at the Middlebury Community Network Science Center (our desk) is, "how in heck does one measure the "global temperature" in the first place"? If we asked you what your skin temperature is right now, you'd likely answer, "Where?" The temperature on your nose is likely far different from the bottom of your feet or other places you might measure. With the greater portion of the earth covered by water, and no floating temperature recording buoys every mile or so, how can we get an "average"? Well, satellites can measure ocean temperatures ( we'll talk more about that later ) but here in the U.S., for example there are only 1221 U.S. Historical Climatology Network (USHCN) stations, and our math shows that to be about one every 3,400 square miles. ...time to break out the lifeboats. Darn, they're stealing our skiers! What's that straight line running through the annual average temperature readings? The linear regression line obtained from the statistical output is the "best-fitting" straight line that can be drawn through the data. It is designated by the equation Y = b1X + b0, where X represents the year, Y represents the predicted temperature anomaly, b1 is the slope of the line and b0 is the Y intercept of the line. Now you know. While we can joke about individual station readings, in fact there may be something skewing the data. Berkley, California, for example, was a sleepy little town back in 1857, when the data starts. Since that time, it has grown into a much larger city, with many miles of asphalt roads operating as near-perfect "black body" heat radiators. This is known as the "urban heat island" effect. Many Climate Scientists now seriously doubt the accuracy of even the 20th century section of the hockey stick. This NOAA USHCN climate station of record #415018 in Lampasas, Texas, was found to be tucked between a building and two parking lots, one with nearby vehicles. According to the surveyor, it is right next to the ACE Hardware store on the main street of town. While likely representative of the temperature for downtown Lampasas, one wonders how well it measures the climate of the region. In her survey, volunteer surveyor Julie K. Stacy noted the proximity to the building and parking, which will certainly affect Tmin ( the lowest temperature ) at night due to IR radiance. Daytime Tmax is likely affected by the large amount of asphalt and concrete in the area around the sensor. You too can check the temperature history near your Grandpappy's home by accessing the Historical Climatology Network (USHCN) stations databank. While Al Gore's Oscar and Nobel Prize winning film, An Inconvenient Truth, has serious students of climate change laughing their heads off, the British didn't think it was very funny. The British High Court has ruled that it cannot be shown to students without first having a disclaimer that it is "propaganda", instead of a "documentary". Those Brits just don't seem to have a sense of humor... or maybe they just think scaring little kids isn't an honorable pastime. Nevertheless, the film makes a good outline for further discussion. 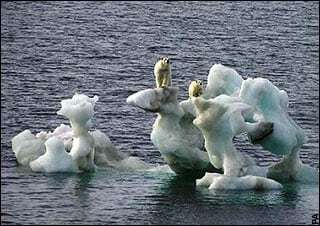 Let's start with those poor little Polar Bears, taking their swim in the vast, empty Arctic ocean, just before they drown. Carole "CJ" Williams probably sums it up best, so we'll just quote her below..
At left is a screen shot from the Greenpeace web site, from a video which drips with the urgency of stopping the "melting" of the Arctic Ice Pack. But look closely: Those are shear lines, where the ice has broken, not "melted". Melting does not occur in particular paths across the ice sheet, except when being zapped by aliens in UFO's. Note closely the comment "more severe storms that wreak havoc on our home and communities". It has become most popular to blame global warming ( and man ) on virtually everything under the sun. And we mustn't forget to throw in a non-sequitur related to the "elderly and poor" - whose beachfront condos will soon be under water, no doubt. But a new study released in Jan, 2008 by Chunzai Wang, a research oceanographer at the National Oceanic and Atmospheric Administration's Miami Lab and the University of Miami, suggests that Global warming could actually reduce the number of hurricanes that hit the United States. Wong found a link between warming waters, especially in the Indian and Pacific oceans, to increased vertical wind shear in the Atlantic Ocean near the United States And wind shear - a change in wind speed or direction - makes it hard for hurricanes to form, strengthen and stay alive. His conclusion is, "Global warming may decrease the likelihood of hurricanes making landfall in the United States,"
The global warming hysterians very typically use photos of perfectly normal weather phenomena to promote panic ( and presumably, donations to their cause ). Particularly popular are videos of calving glaciers, which break off and create quite a splash when they hit the water. But any 10-year-old knows that a calving glacier is a result of a growing, not receding glacier. A receding glacier, well... recedes...and calves no more. To make a very long story much shorter, the warmer oceans have indeed been selectively melting some portions of the Arctic Ice Cap, but severe storms created large waves which broke up, rather than melted a substantial portion of the edges of the polar ice. This re-freezes in the winter. And you don't have to panic: the cold winter of 2007-2008 has returned the arctic ice cap to a handsome 13,000 000 square kilometers - which may melt again in normal summer melting cycle. There's tons of research going on in this field as well. And about those "melting glaciers..."
And down south last September, NASA satellites showed the Antarctic Ice Field to be the largest it has ever been in the 30 years it has been observed by satellite (based on an analysis of 347 million radar altimeter measurements made by the European Space Agency's ERS-1 and ERS-2 satellites). The terminus of Tsaa Glacier in Icy Bay in July 2005. The terminus of Tsaa Glacier in June 2007 after a recent advance of the glacier. Note the position of the large waterfall. The glacier advanced about one-third of a mile sometime between August 2006 and June 2007. Al Gore tells us the Greenland ice cap is thinning, but he doesn't mention that a newly discovered volcanic "hot spot" may be a contributor, along with warming on the coast due to warmer waters coming up the gulf stream. In general, we found growing glaciers outpacing melting glaciers by a good margin. Nothing like cherry-picking an isolated example to create panic, Al. Our Oceanography friends tell us that the actual measured rise in average ocean levels is on the order of 1.6 millimeters (about the width of a match ) annually. There are 25.4 mm in an inch, so in 25 years, the oceans might be up about 1.5 inches or so if the trend continues. In a thousand years, it will be up a whopping 64 inches, and everyone but the NBA is clearly in serious trouble. Al Gore, on the other hand, recently said the problem is much worse than previously thought, and the Polar Ice Cap will be completely gone in 5 years. If you make a quick knee-jerk assumption, you'd probably conclude that something has to be melting somewhere to cause such a steady rise, however miniscule. But there's another principle of physics at work here called thermal expansion. When you heat an object, it gets bigger. Since the oceans have been slowly warming over the past few centuries, the volume of the oceans has also been increasing a tiny bit, and that can possibly account for most, if not all, of the 1 mm per year rise in the average sea level. Old glaciers are a wonderful repository of historical information, because past samples of earth's atmosphere are locked up in them. Coral heads and Sargasso Sea sediments also leave Carbon 14 and Oxygen 18 clues to the past temperature of the earth. We all agree that the historical CO2 curves and the temperatures curves closely match each other. But when we look closely at the CO2 and temperature data found locked in ancient ice core samples, we find that increases in CO2 are actually following increases in temperature and that CO2 doesn't cause warming - warming causes CO2 to increase. Summary - Exactly what have we learned here? 9. The UN IPCC has corrupted the "reporting process" so badly, it makes the oil-for-food scandal look like someone stole some kid's lunch money. They do not follow the Scientific Method, and modify the science as needed to fit their predetermined conclusions. In empirical science, one does NOT write the conclusion first, then solicit "opinion" on the report, ignoring any opinion which does not fit their predetermined conclusion while falsifying data to support unrealistic models. 10. Polar Bear populations are not endangered, in fact current populations are healthy and at almost historic highs. The push to list them as endangered is an effort to gain political control of their habitat... particularly the North Slope oil fields. 13. Greenland is shown to be an island completely surrounded by water, not ice, in maps dating to the 14th century. There is active geothermal activity in the currently "melting" sections of Greenland. 16. Scientists who "deny" the hoax are often threatened with loss of funding or even their jobs. 20. In short, there is no "climate crisis" of any kind at work on our planet. We've heard several anecdotal examples of local children becoming frightened after seeing Al Gore's movie, and maybe that's why we're so angry with him. To counter that, the British High Court has ruled that the film, if shown in their schools, must be preceded by a disclaimer that it is propaganda, not a documentary.. and a specific list of 9 distinct inaccuracies must be included in the warning. The 9 have since expanded to 35, and we heartily encourage you to examine each and every one by clicking HERE. From our point of view, we're watching a world gone mad, with everyone hustling to get a piece of the action. Politicians, radical environmentalists, and even mainstream businesses are scrambling to appear as "green" as they can - and reap of piece of the financial action sure to follow as funds are diverted from normal paths in a headlong race to save the planet. Some of this is actually good. We do need to cut down on our use of petroleum fuels, because they're becoming more and more expensive to find and recover - and as Will Rogers said, "They're making more people every day, but they ain't making any more dirt." Green is good, and we here at the Community Network try very hard to be good stewards of the environment. We recycle everything, drive 2nd-hand cars that get high gas mileage, and even had only one offspring - thus gaining one whole human lifetime of "carbon credits". It is overpopulation, after all, that is using up our resources at an ever-increasing rate. So the Great Global Warming Hoax could have a unintended positive side in energy conservation, and even Hitler made the trains run on time in Nazi Germany. We understand that those who jumped on the Global Bandwagon early on are now in a difficult position. Many are now searching for a way to back out quietly, without having their professional careers ruined. Others are continuing to miss-quote all the bad "science" on the subject, desperate to perpetuate what appears now to be only a myth. The Popular Journalists would starve if folks stopped reading their global hysteria books, and if folks stopped believing that Global Warming is man-made, they'll have to find some new themes on catastrophic events and sell us on the idea that we're to blame. A recent U.S. Senate report quotes 400+ scientists who originally bought the global warming hoax, and are now confessing that they don't believe in it any more. Yes, Sen. Inhofe, who sponsored the report is a minority Republican on the U.S. Senate Committee on Environment and Public Works, and the liberal Democrats aren't about to believe anything he says, but we'll give him credit for being the first member of Congress to take a stand against the growing hysteria. It's a mess, and we're in it up to our cultural necks. What is potentially more alarming, is that some of the early knee-jerk scientists that were so quick to jump on the climate panic bandwagon are now fighting desperately to save their careers by deliberately producing falsified data in a last-ditch effort to support their individual research and save their professional reputations. In our own research, we uncovered some "data" in which a CO2 curve from an ice core study was conveniently moved some 83 years down the time scale, so the desired "results" could be obtained. It's much too lengthy to discuss here, but if you'd like to delve into the subject in depth, we've posted the full paper by Prof. Zbigniew Jaworowski, Chairman of the Scientific Council of Central Laboratory for Radiological Protection in Warsaw, Poland. Powerful political forces are also hard at work, attempting to preserve what we currently perceive as to be a myth by government-enforced "education". The State of California is attempting to require the myth to be taught in all of their public schools. Given the general level of science literacy of most public school teachers, particularly in the lower grades, we wonder from where the course materials would come. We're betting Greenpeace would be more than happy to supply the "information". We're also betting that Vermont could soon follow suit. We don't call ourselves the Green Mountain State for nothing. All of the empirical evidence now favors the "conservatives", who apply the laws of physics and chemistry to known data and conclude that anthropogenic global warming can't be happening. The coup de grace on the conservative side is the fact that CO2 is lagging temperature, and thus, they say, what happens next month can't possibly be affecting what is happening today. We tend to favor this logic. The "liberals", on the other hand, have turned to computer modeling to "prove" the world is about to come to an end. Models can and in fact are being constructed which can prove anything you want. By tweaking the data, you can even make them come out with the opposite answer. "Modeling" is a perfect tool for perpetuating a scam like this, because they have absolutely no basis in factual science, yet are easy to sell to the unsuspecting public who thinks they are a part of legitimate research process. Unfortunately, there is much "model tweaking" (OK, "faking" is the better word ) being done by the Hysterians to "prove" the sky is falling. This is commonly known as Junk Science. We saw one climate model in which the temperature was held constant while the CO2 concentration was arbitrarily doubled, a brilliant erasure of the laws of physics. The ultimate "judge" at present is the press. Fortunately for the Junk Scientists, the scientifically illiterate reporters and other popular journalists are quick to grab anything that calls for change, change, change ( does that have a familiar ring to it?). Since most of the press, ranging from our local folks to the New York Times, tend to showcase the Junk Science and suppress the empirical results, the equally science illiterate public gets only one side of the story, and they, in turn, quickly organize mass demonstrations calling for change, change, change. Presumably, if you march enough protest signs around the country, the Laws of Physics will bend to your will. Great News!! We now have a 34 ACRE NURSERY SITE underway in Maine with a wood and solar heated greenhouse for tree seedling production. This will enable us to grow out millions of seedlings for transplanting to deforested areas across the north woods. If you would like to DIRECTLY OFFSET YOUR CARBON FOOTPRINT there is a PAYPAL DONATION button under the picture. ANY AMOUNT will help further the CO2 Reduction project!! Thanks!! Editors Note: We have an even better offer: For every 10 bucks you send us, we will hold our breath for one full minute before exhaling the CO2 into the atmosphere. This "carbon offset" will make you feel good about driving your Hummer to the next Global Warming demonstration. "Climate Science" has become the new gold mine for research funding. Any funding grant application today had better have the words "Global Warming" in it somewhere if you want to rise to the top of the pile when the money is handed out. Spending on "climate research" has skyrocketed from $175 million to $5 billion annually, and you'd better make sure your "results" support AGW, or the Leprechaun will get away and your pot of gold will vanish. "Peer Review" has generally become a laugh, as the Hoaxters now all review each other's work, and the cash register keeps ringing. A huge proportion of the "climate scientists" now at work weren't even interested in the subject a few years ago, and it's a bandwagon playing the new pop tune of "Ca-Ching, Ca-Ching". The Hoaxters now control many of the science journals, and are suppressing any honest research that exposes what John Coleman, founder of The Weather Channel, has called "the greatest scam in history". In writing this editorial, we of course automatically become "deniers", the heathens of physics who haven't converted to the new religion of global panic. It's now 100% honorable to fake your results, because keeping a paycheck is a most honorable pursuit. It's now critically important to keep the hoax afloat, for if the public ever finds out global warming is a purely natural phenomenon, the money will dry up in a heartbeat, because no government wants to waste money on something man can't possibly change. Recently, several NASA scientists have resigned in protest of the bureaucrats who run the agency supporting Junk Science in order to secure more funding for climate-related satellite systems and other "research". And scientists who speak out too loudly against the hoax have actually been fired for crossing paths with the politicians promoting Junk Science, as recently happened to University of Washington climate scientist Mark Albright, who was dismissed from his position as associate state climatologist, just weeks after exposing false claims of shrinking glaciers in the Cascade Mountains. Seems Seattle Mayor Greg Nickels claimed the Cascade glaciers were melting, and Albright, in charge of the glacier studies, said they weren't. Nickels had enough clout to get Albright bounced from his job. Our public schools seem to be highly infected with what the serious climate scientists are now calling the new "religious cult" of anthropogenic global warming hysteria. No longer are teachers inviting their students to explore climate change - now they are being instructed to "make a nice poster showing how you can stop global warming". This appears to be primarily an American phenomenon. Graduate schools in technology report their classes are mostly filled with foreign students, and U.S. Public High School students are the most science and mathematics illiterate of all developed nations. "Education" majors ( our future teachers ) have the lowest SAT scores of any college major so we are stuck in a catch 22 situation where the least qualified to teach anyone about anything are churning out mostly scientifically illiterate students who then go off to college and emerge with thousands of degrees in Art History with no job in their field waiting for them when they graduate. This children's book "explains" the Global Warming Hoax to English-speaking children everywhere. Here's a textbook case ( pun intended ) of how to pull the wool over their eyes. Simply insert a fraudulent graph clearly showing Climate Temperature to be following CO2 levels, in the same manner as Al Gore. This is easily done by swapping the actual CO2 and Temperature graphs, as shown below. Of course, the actual data shows just the opposite - that CO2 lags, not leads temperature, and thus "proving" just the opposite. Don't worry, the parents aren't smart enough to detect the lie, either. The battle now seems to have settled down as a war between two major information sources. The "mainstream media" who controls the printed word on paper ( such as the book above ) and the talking heads on TV are generally supporting the Junk Science. The Internet - last bastion of free speech and the only significant outlet for empirical science, is slowly gaining ground exposing the scam, but so far it's pretty much an imbalanced situation, since the Junk Scientists also know how to build web sites and blogs and are doing their best to spread the panic in that media as well. For example Richard S. Lindzen, in his paper at the 2005 Yale Center for Globalization conference clearly points to one particular pro-hoax web site calling itself "Real Climate" which tells us that it is all about "climate science from climate scientists", featuring among others, the now universally discredited work of Michael Mann and others who were too quick to become his overnight followers. The site isn't actually run by "scientists", it's actually run by Environmental Media Services, which specializes in spreading environmental junk science on behalf of numerous clients who stand to financially benefit from scare tactics through environmental fear mongering. Lindzen says, "This website appears to constitute a support center for global warming believers, wherein any criticism of global warming is given an answer that, however implausible, is then repeated by the reassured believers. A collection of stock responses for believers is also featured on Gristmill, where the Popular Journalists and mainstream media can quickly obtain a handbook for perpetuating the scam, and become instant experts on the spot. In the end, time will be the final judge. If the ice caps don't melt in our lifetimes ( or in 5 years, as Al Gore is predicting ) then future historians are going to have a rich trove of material on how the entire world went bonkers over a global temperature shift of a few tenths of a degree attributed to our "carbon footprint". If New York floods during the last game of the World Series, then the Computer Modeling has won out over the Laws of Physics and at least we'll be able to make new models which will cure cancer, end starvation, stop wars, and lower our taxes all at the same time. Most of the best research has been performed in the last 3 years, and strongly supports the notion that CO2 plays little role in global warming. You will probably not be allowed to find this out, except in places like this. The IPCC policy writers were actually instructed to ignore the most recent and likely best information in their earlier reports to the world's governments, and of course the Popular Journalists continue to quote the older, now debunked "science" that led to the panic in the first place. It has turned real nasty, and it is our strong feeling that much skullduggery is afoot. One of the hallmarks of American politics is to tell a lie often enough until it magically becomes the truth. The corruption of the UN IPCC would make another long treatise in itself, but we won't go there in this particular piece, because we don't want to scare our children into thinking that scandals in the UN were making unwitting liars out of their teachers. Remember, the UN IPCC reports are the very foundation of the Global Warming Hysterians' arguments. That's where they get the "all the world's climate scientists now agree" baloney. Scientists who disagree with the policy writers ( who are largely bureaucrats appointed by their own governments ) are ignored in the reports, a well known phenomenon. And several IPCC scientists are currently raising Cain with the IPCC policy writers to stop using their name as "agreeing" with the Junk Science IPCC reports. ( The IPCC claims that all of their member scientists and contributors approve of their phony reports, and as best we can determine at the present time, a majority probably does not). Alec Rawls probably sums up the IPCC corruption best: "What I found interesting in the IPCC report is how blatant the statistical fraud is, omitting the competing explanation from the models completely, while pretending that they are using their models to distinguish between anthropogenic and natural warming. These people are going to hang on to their power grab until the bitter end." And we might be wrong. We're pledged to good science, without any political or environmental agenda producing hasty conclusions, and this ball game is still in play. We've done an enormous amount of homework, and reached a preliminary opinion on the matter, and are intent on remaining politically independent in this regard. If we're wrong, delaying immediate action will only hasten doomsday. If we're right, then nature will take its course as it always has, and normal life will go on by adapting to climate change, rather than freaking out over a pending climate catastrophe. That's what the Scientists' letter to the U.N. was all about. What can you do to further expose this Global Hoax seemingly being spread to promote radical political and environmental issues? You could start by sending the URL of this page to your friends and other "regular" folks who have no environmental ax to grind and are only seeking some realistic appraisal of the situation. This article has now been "peer reviewed" by dozens of highly qualified scientists in fields related to climate change, and there has been no fault found in our physics, chemistry, or mathematics to date. It has already "gone viral" world-wide, and has been read in 83 foreign countries at last check. We invite, but flames and rants and other childish stuff will be deleted and you won't even get the courtesy of a reply. We do welcome comment from intelligent folk who have something original to say, but please don't bombard us with cut-and-paste cherry-picking from climate hysteria sites on the internet, because trust us, we've already read all that. We admire your tenacity in reading this all the way to the end. While the hoaxers claim "the science is settled, the time for debate has ended", in fact new books and papers are emerging daily. You may help us build our Climate Science Library by making a modest donation using the Pay Pal button at the left. Truth is, Al Gore has a lot more money than we do.. and we promise to share what we learn with you in future essays. Thanks for helping us keep on top of this issue! Editor's Post Script - "it ain't over 'till it's over....."
New information continues to emerge, so we'll keep the issue flowing here in this "Post Script" section. "Even for scientists your article is more convincing than many of the truly peer-reviewed science papers, and I have sent it to a number of my meteorologist and climatologist friends...."
"Here is probably the best internet posting anywhere in the world for laypeople who want to know the truth about "global warming". Our thanks to Jim Peden for permission to post it here." Also, we received an unsolicited and previously unpublished short manuscript from Dan Pangburn, a Professional Engineer, who, like us, became curious and conducted his own independent study of the global warming situation. This paper is unusual because it contains original new plots created by Dan from raw data sources. Through a different analysis, he arrived at the same conclusion, and you may read his paper by clicking HERE. We've just been made aware of a summary article by John K. Sutherland that is almost a mirror image of our own, except he published it on 10/29/07, several months before ours. When two people come up with virtually the exact same set of issues, data, and conclusions, it is often called a Conspiracy. When they do it completely independent of one another, it is sometimes called Due Diligence. Please read Dr. Sutherland's fascinating synopsis ( briefer than ours but very complete ) by clicking HERE. Open your wallets, folks. Sen. Barbara Boxer has a full-court press going for adoption of the Climate Security Act – S. 2191 (Lieberman-Warner) global warming cap-and-trade bill. This will impose a $1.2 trillion tax increase over the next 10 years according to the Congressional Budget Office. Some say Sen. Boxer is crazy. We think she's crazy like a fox. What better way to secretly increase entitlement spending than by promoting a cure for a nonexistent disease? If you'd like to read a very interesting essay on the sociological implications of AGW hysteria, please click HERE. This was a graduate essay written by Chad Cooper, who has really done his homework. In exploring many avenues of the AGW propaganda machine, he surmises, "The propaganda techniques discussed are tactical methods to convince the world population that humans are the primary cause of global warming. The strategic goal, however, is to incorporate as many of these methods into the daily life of the average citizen, so that he accepts the theory as fact. From new articles, t-shirts, laundry detergent, political speeches, movies, and appliances to car insurance commercials, AGW has permeated modern society to the point where there is no escape." Don't you sense just a tiny bit of a con job? "Global Mourning" a mental disorder? Our opening question, "Have we become a nation of overnight loonies?" may turn out to be a truth spoken in jest. Some very serious mental health researchers are now examining a new mental disorder called "Solastalgia", a form of Post Traumatic Stress Disorder caused by a palpable sense of dislocation and loss that people feel when they perceive changes to their local environment as harmful. An expanded discussion of this is available by clicking HERE. So, next time a Global Warming Hysteric starts chanting about polar bears and Disney World floods, please be kind and bear in mind that they may be half a bubble off plumb. Come to think of it, 50% of the population is, by definition, below average intelligence. And according to the National Institutes of Health, 21% are mentally ill.
That might explain the polar bear suits and Kumbaya singing to stop global warming. We think the t-shirt at right is cooler than a polar bear suit (click on image). And no, we don't make any money by sending you there, darn it. Al Gore now combines Amway and Evangelism to produce a series of "training sessions" which in turn will produce an army of "climate change fighters". His reported advertising budget? $300,000,000.00. Each participant makes a commitment to give the presentation at least 10 times. No mention of a pink Cadillac as a prize for the most converts. You're going to love this. Another chunk of ice has broken off the ice shelf around the Antarctic Peninsula. The Hysterians quickly jumped on it, claiming it was another effect of "global warming" ( "caused by man" is now clearly understood in the GW Looney Community ). But surprise, surprise, there are active volcanoes in the same area. NASA has published an image showing the surface temperatures in Antarctica ( on the left, below ). This panicked the GW Looneys so much they quickly posted the caution that "a number of (unnamed ) editors have objected to the NASA image" and imploring their religious following, " Please do not use this image ". This is the original NASA image, showing the assorted hot spots due to underground thermal activity around the Antarctic continent and the associated temperature trends. This is the same image being distributed around the Global Warming Looney Bin, with suitable admonition against its use. Since late 2001, the trend of global surface temperatures has been firmly downward. We now know with reasonable confidence that solar intensity and world ocean currents are the primary temperature moderators... since CO2 levels have continued to rise throughout this past decade of cooling. This cooling hopefully won't last forever, of course, because the climate is always changing. Seems you can never satisfy the British. We've received an urgent request for more of our fine U.S. - made CO2 from Robert Felix ( left ) and Hans Schreuder (right) in London. Ah, those UN IPCC Climate "Models"
And the sketch at the right, just in case he still didn't get it. The 2008 International Climate Conference in New York City wrapped up, and interestingly enough, it appears they also came to the exact same conclusion as we had more than a month earlier, with 500 signatories. Their final Declaration is repeated below. The reaction from the global warming fanatics was predictable - the scientists gathered in New York were all heathens financed by the big oil companies, who refuse to convert to the new religion founded by Al Gore ( after he flunked out of divinity school). The president of the World Federation of Scientists is actually an alien (financed by the big oil companies) and sent down to destroy the world by preventing us from stopping global warming. Incidentally, we were asked to become co-signers of the declaration below, to which we obliged with the greatest humility, in view of the truly outstanding group of climate scientists and other presenters at the conference. James A. Peden - better known as Jim or "Dad" - Webmaster of Middlebury Networks and Editor of the Middlebury Community Network, spent some of his earlier years as an Atmospheric Physicist at the Space Research and Coordination Center in Pittsburgh and Extranuclear Laboratories in Blawnox, Pennsylvania, studying ion-molecule reactions in the upper atmosphere. As a student, he was elected to both the National Physics Honor Society and the National Mathematics Honor Fraternity, and was President of the Student Section of the American Institute of Physics. He was a founding member of the American Society for Mass Spectrometry, and a member of the American Institute of Aeronautics and Astronautics. His thesis on charge transfer reactions in the upper atmosphere was co-published in part in the prestigious Journal of Chemical Physics. The results obtained by himself and his colleagues at the University of Pittsburgh remain today as the gold standard in the AstroChemistry Database. He was a co-developer of the Modulated Beam Quadrupole Mass Spectrometer, declared one of the "100 Most Significant Technical Developments of the Year" and displayed at the Museum of Science and Industry in Chicago. you may visit our home page by clicking HERE. Otherwise, you may close this browser window when finished.